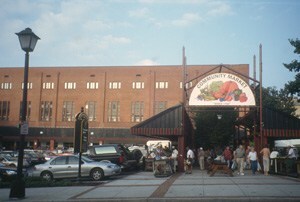 The Lynchburg Community Market, one of the oldest in the United States, is an important commercial and social gathering place. Now in its third century, the market has moved several times, continually adapting to a changing environment. The market is poised, once again, to bolster its role as a key civic institution and economic engine. The City of Lynchburg, VA, asked PPS to take a critical look at the issues and opportunities facing Lynchburg’s historic Community Market and make recommendations for strengthening the market’s future as a catalyst for the local economy and as an anchor for stimulating development and investment downtown. The current revival of downtown Lynchburg is largely centered around the market. Storefront retail is making a comeback, empty buildings are being converted to loft apartments and parties and events drawing thousands on summer nights take place in front of the market. To capitalize on these positive developments, the market must take the initiative to build on its strengths and correct its weaknesses. PPS categorized issues and opportunities for design, merchandising, management and operations, parking and funding of the market. PPS provided the Lynchburg Community Market (LCM) with a strategic framework to increase sales and customer visits, move towards more sustainable operations, build on the momentum of investment surrounding the market, and create a stronger sense of place. Lastly, a series of next steps were recommended to move the market agenda forward in a constructive and achievable manner.